Dr. Momoda is currently the Vice President for Strategy at HRL Laboratories, LLC in Malibu, CA. She leads the strategic planning, customer and LLC member interfaces for the laboratory. 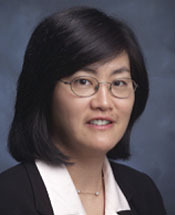 Prior to this assignment, she was the director for Sensors and Materials Laboratory where she lead the research and development of advanced structural, battery, architected and nano-materials and characterization as well as cutting edge microelectromechanical (MEMS) and infrared detectors. Dr. Momoda joined HRL Laboratories, LLC in 1990, working on the research and development of mixed metal oxide materials for electronic, optical and chemical sensor applications. She has 18 years of experience in the field of materials synthesis, processing, and characterization for electronic and structural Applications. As a Research Department Manager, she was in charge of several major projects in the area of smart materials, materials for thermal management, gas sensing, fuel cell components and the modeling and prediction of materials reliability. Dr. Momoda received her B.S. degree in Chemical Engineering from the University of California, Los Angeles and M.S. and Ph.D. in Materials Science and Engineering from the University of California, Los Angeles. Dr. Momoda has authored or co-authored 18 published papers and has 16 issued patents. She is also involved with engineering advisory boards at several Southern California universities.